Has a Trauma Made It Difficult to Feel Safe and Whole? Do memories of a traumatic event keep coming back, even when you try not to think about it? Do you try to avoid people and places that remind you of the trauma? Are you struggling to feel close to or trust anyone? Are you experiencing quick emotional changes, which make you feel out of control? Do you wish you could put the trauma behind you and feel like yourself again? Traumatic events can affect everything in your life. You may feel uncomfortable and uneasy, as though danger is around every corner. Perhaps certain places feel especially unsafe, and you try to avoid them, no matter what. You might struggle to concentrate, and you’ve noticed that your grades are dropping and your relationships are suffering. Maybe you feel as though you can’t confide in anyone, even your closet friend. You may feel ashamed, embarrassed or guilty because of what has happened to you and wonder why you just can’t handle it or push the thoughts aside. Perhaps you struggle to fall asleep at night and wake up frequently with nightmares and feelings of panic. In the morning, you may struggle to wake up and get out of bed. As the day goes on, it may seem as though nothing feels normal, and things like classes, homework or practice seem meaningless in comparison to what you have gone through. All of your energy might be dedicated to regret, pain and fear. Or, maybe you are throwing yourself into school and extracurriculars so you don’t have to think about what happened. If the event occurred a long time ago, you may be wondering why it is popping back up now or why you can’t let it go. Maybe everything feels foggy and confusing, and you feel as though you are broken in some irreversible way. If you are a teenager who has experienced a traumatic event, you are not alone. Studies show that, before age 18, 39-85 percent of adolescents will experience community violence, while 25-43 percent will experience sexual abuse. Physical abuse occurs when someone who is supposed to be taking care of you hits you or hurts you so hard that marks are left. Sexual abuse occurs when anyone forces you into unwanted sexual behavior. Emotional abuse occurs when someone who is supposed to care for you consistently puts you down, insults you and makes you feel worthless. Dating violence is very common during the teenage years, and it can include all three forms of abuse. However, it can also be difficult to recognize dating violence, especially if you are new to relationships or have seen very few adults engage in healthy relationships. Intense jealousy, constant texting, negative comments on your clothes, belittling language, pressure to engage in sexual acts or attempts to isolate you from your friends and family may be signs of dating violence. If you have recently experienced a traumatic event, regardless of its form, feeling sad, isolated and unable to focus on anything else is a very common response. Sometimes, with time and good support, these symptoms can go away on their own; we call this the natural process of healing after a traumatic event. Other times, particularly if you do not get support or even get teased or put down for revealing that the trauma happened to you, painful feelings can get stuck and the natural healing process cannot occur. If something harmful happened to you during childhood, it may be reappearing now as your mind and body grow and develop. Thankfully, no matter what kind of trauma you have experienced, you can begin to heal and feel like yourself again. Regardless of what has happened to you, you are not broken. 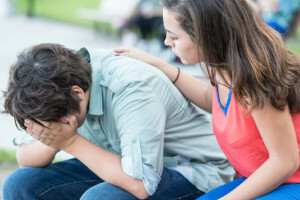 After a trauma, it can be difficult to let go of self-blame and feelings of shame. But, with help and support, you can begin to understand that what happened was not your fault, and that you can feel okay again. Teen trauma therapy is one of my primary specialties, and I know that evidence-based treatments can help you feel better and more secure. In sessions, I will help you develop coping skills so that you can handle symptoms of trauma with greater ease and feel more in control of your emotions. Then, together, we can discuss your memories. Teen trauma therapy is a safe place for you to share your emotions and thoughts without any fear of judgment. You can stop holding difficult feelings by yourself and start to receive support so you can start to feel better again. As you learn more about trauma and how it works, you can really understand that what happened was not your fault, and you can feel in control of your life again. The trauma in your past does not have to define your future. As we begin our sessions, it is important that you have a parent or guardian give permission for you to attend therapy. A supportive adult can be a helpful part of this process. If your parent or guardian is not supportive, we can try to find someone else who you trust, although your parent/guardian will still need to give permission for therapy. Many teens fear that coming to counseling and sharing what has happened will lead to negative consequences for them or others. As a therapist, I am required to report certain types of abuse. I will work with you to make sure that you are prepared for what might happen if I have to make a report. It is important that you feel safe and heard throughout this process. I encourage you to remember that, if someone has done something to you, they may continue to abuse others. And, if someone does need to face consequences, it is because of their actions, not yours. Teen trauma therapy can be a source of great relief. You don’t have to feel stuck or alone any longer. You can free yourself from the constant memories that have been bombarding you. Too often, I have seen people carry a heavy secret all of their lives, only to finally share in their old age. You are young, and you have so much life ahead of you. With help, you can rediscover who you are and begin to live with more ease and joy. If you are under 18, your parent or legal guardian will need to give approval for therapy. But, he or she does not need to know the details of what has happened to you. If no law has been broken (by the person who may have caused the trauma), then you and I will work together to figure out how to tell an adult that will be supportive of you and which adult to tell. If a law has been broken by the perpetrator, then I will need to give your parents a general statement of what happened and a more detailed report to the appropriate authorities. If I go to teen trauma therapy, other people will find out. Hilo is a small town, so I understand how frightening it can feel to talk about something so personal. It can seem like everyone knows everything! In therapy, I will keep everything you say confidential. I will never share anything you tell me without approval unless a perpetrator broke a law. Even in that case, I will only tell the minimum amount of people I need to in order to keep you and others safe from harm. You never have to tell your friends and family members if you don’t want to, although if you do have a supportive adult in your life, I can help you find ways to ask them for support (while sharing only what is comfortable for your to share). Is it weak to admit I need help? There is nothing wrong with looking for support, especially when something intense has happened in your life. And, seeking help is a sign of strength and courage. Trauma is a common experience. It may seem as though everyone else is doing well from the outside, but it is impossible to know exactly what is happening inside those people. Through teen trauma therapy, you can learn coping tools that can help you throughout the rest of your life. You may feel better equipped to support others as well. If you are ready to feel like yourself and let go of the effects of a trauma, I invite you to call (808) 747 3445 for a free 15-20-minute phone consultation. I’m happy to answer questions you have about teen trauma therapy and my practice.